At first, I wasn’t sure if I was going to make it to the game tonight. Tonight’s game was part of my twelve-game mini plan, which I’ve only missed one game so far. Today was the first day of classes for me. And you can’t miss the first class or else you get dropped. Fortunately, it also meant that sometimes you get out of class early. My class was scheduled till 7:35 but I got out a little before 7. I got to Dodger Stadium shortly, thanks to the smooth ride on the 110. I hate taking the 110, but it was a more direct route to get there than to take the 210 to the 134 to the 2 to the 5 to the 110 (since I was exciting Academy Dr. anyway). Right after I parked, the guys in the truck next to me asked me what station I was listening to. I was listening to the Dodger game on KABC 790 as I was driving to the stadium. I got my things together and made my way to the stadium. Surprisingly, I ran into a few guys who were trying to sell tickets. I told one guy, I didn’t need a ticket. I had two! He tried to talk me into giving him my extra ticket. 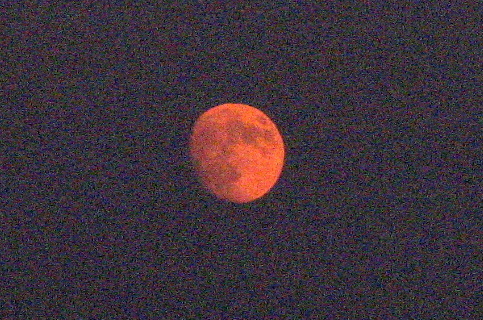 The moon as I was walking in. Padilla had a tough first inning. It lasted about 21 minutes. It was enough for me to get to the top deck just after Matt Kemp hit his homerun. Kemp giving it a try too! 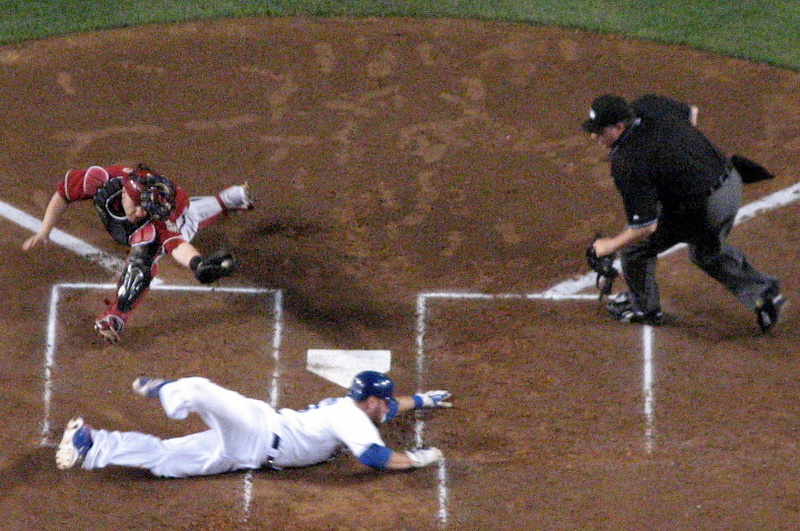 If you were listening to Dodger Talk after the game, you probably heard about this. Play was interrupted for a few minutes because of a remote-controlled airplane flying around the stadium. I think it started in right field somewhere. 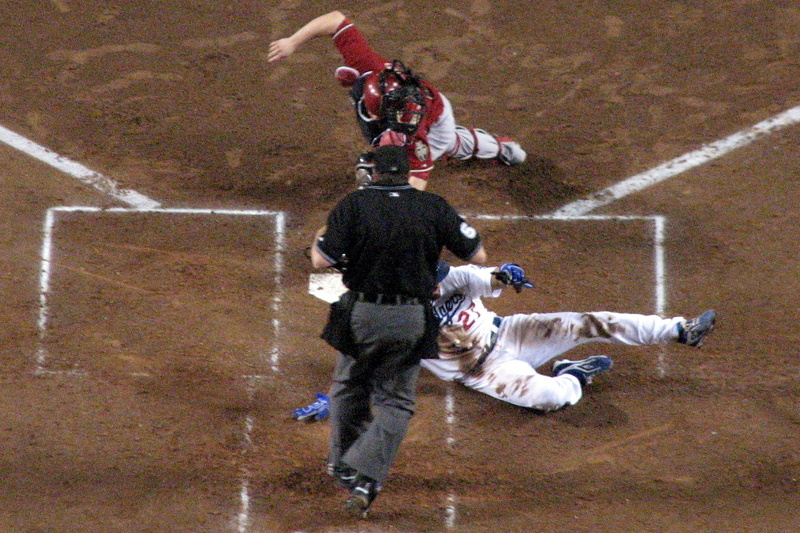 It made it across to left field and back to right before finally crashing in front of the Diamondbacks’ dugout. Auggie Ojeda got out of the dugout and smashed the plane before breaking it to pieces. 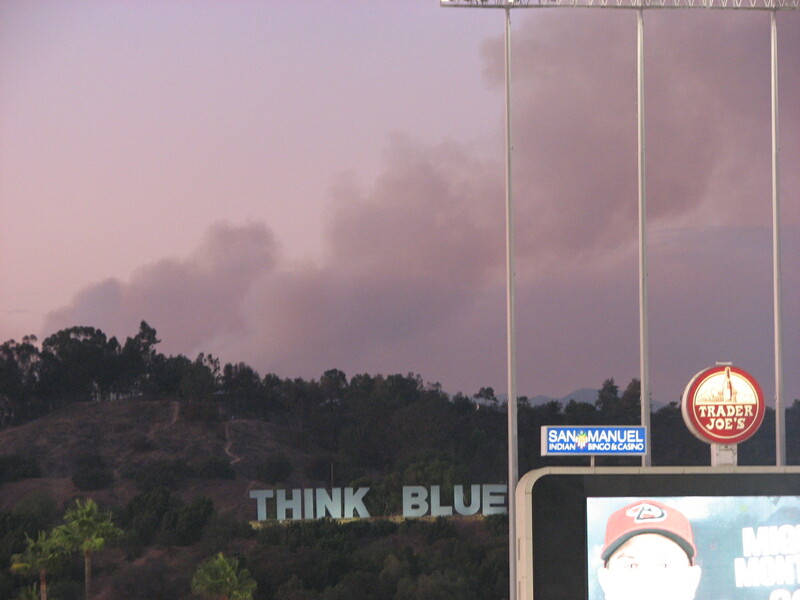 With the fire raging so close yet so far from Dodger Stadium, I was wondering how it was going to affect the game. I arrived at my gate a little after four, unsure of what kind of traffic to expect. Plus, I was ready to leave and didn’t want to stay home any longer anyway. I got to my gate and there were only TWO cars there. Two. I was a little concerned. But then I figured since I arrived so early anyway that was probably the reason there were only two cars there. I looked in my rear-view mirror and noticed the big cloud of smoke behind us. I wanted to stop and take a picture of the smoke behind the Think Blue sign… but figured I better just make my way to the gate. I did notice the difference between driving in and walking in. By the time I got to the parking lot, there were about three or four rows of cars already. Last time when I parked, I was the first one there. I went in and said hi to all the usual people. 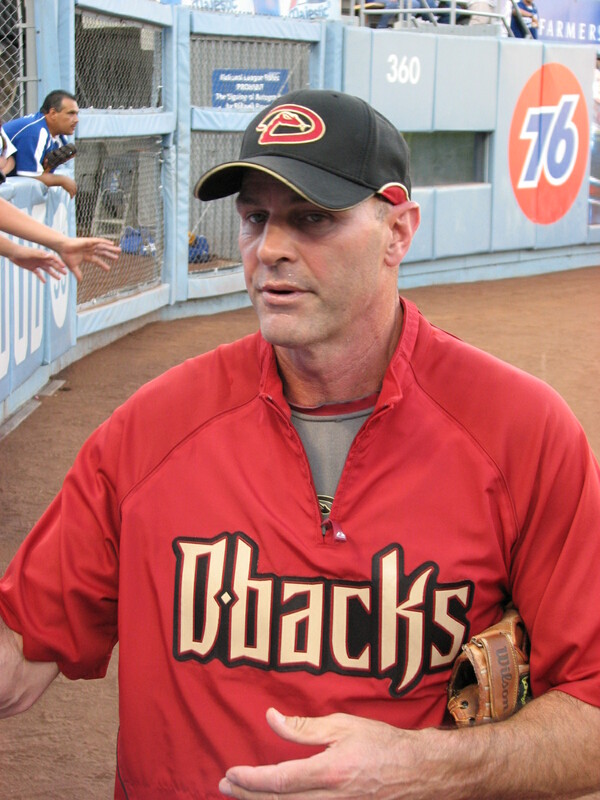 During batting practice, Kirk Gibson came by the Dodgers’ bullpen and started signing autographs. I pulled out my ticket stub, but by the time he got close to where I was, he had to stop. He was probably about five people away from me. Randy Wolf was starting, so yes, I had my Wolf hat on. In fact, one of the security guys told me that I was going to have to check the hat in. I told him, I’ve brought the hat to the game several times and never had a problem before. It’s probably because the hat was in my purse and it probably looked more like a mask than a hat in there. I walked around the field level a little before before the start of the game. I said hi to Laurie, Kristin, and Stacey over in the right field side of the field. 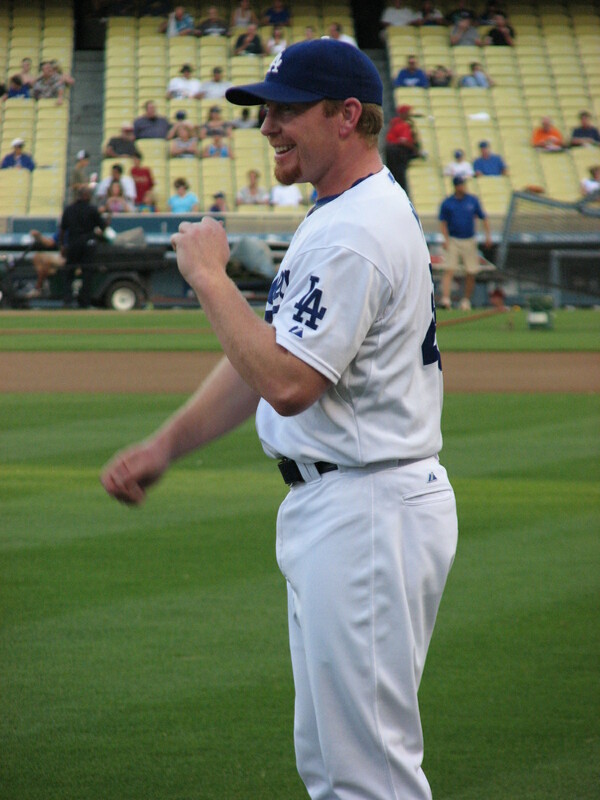 I stopped a little behind home plate to take pictures of Randy and the players as they were taking the field. One of the ushers asked me if I had a little one taking the field. I told her, no, I was excited to see Randy. She noticed the Wolf hat then. I had about two or three people tell me that they liked my hat. After the players took the field, I made my way up to my seat. I was sitting in the reserve level, right behind home plate. 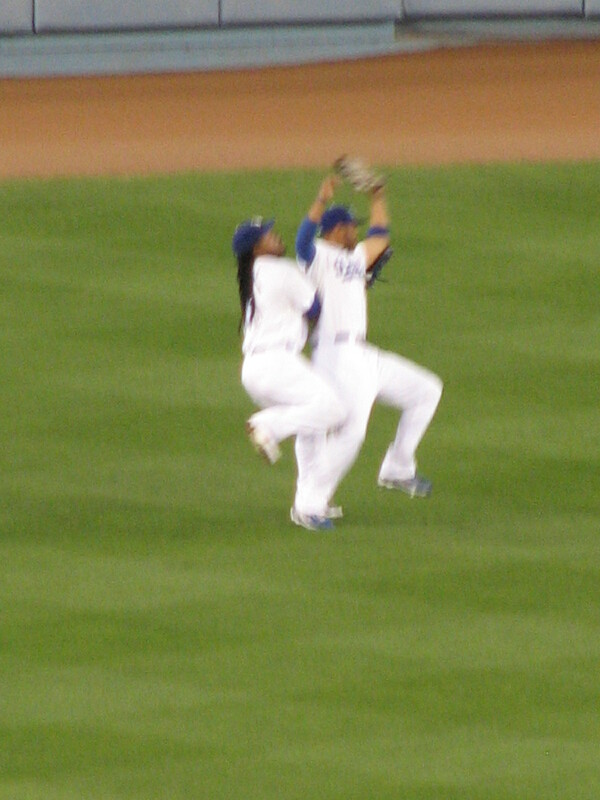 There was a scary/funny moment when Manny collided with Matt Kemp in left center field. Everyone afterward was relieved that they were okay. Then they started joking about how they’ve never seen a left fielder run so far so fast. He was clearly in Matt’s territory when he didn’t need to be. I was sitting in front of a couple where one was a Dodger fan and the other was a Giants fan. Can’t remember at the moment which was which. Right before the trade deadline, Roberto sent me a text about the Jim Thome and Jon Garland trades. I tried to find info online to confirm the trades. Sure enough. Right before the deadline, we got Thome and Garland. 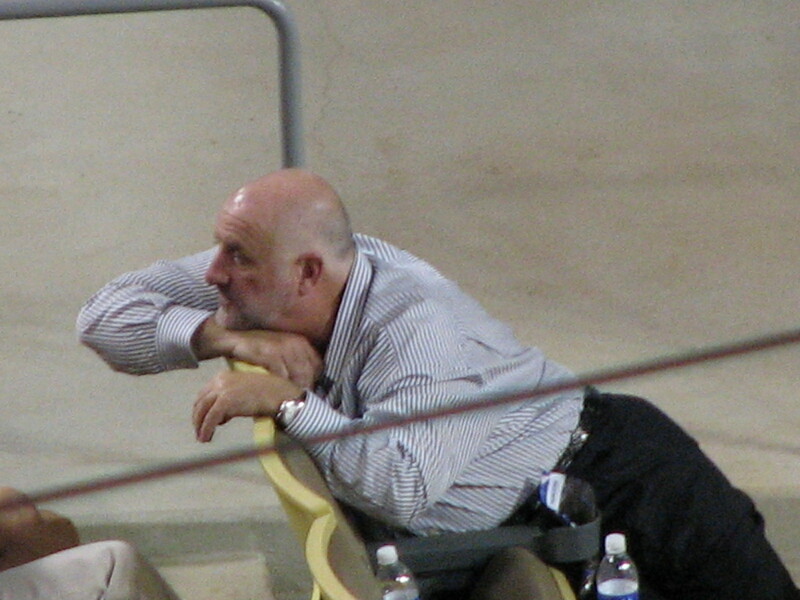 The Garland one was funny, since he was in the Diamondbacks dug out at the time of the trade. Since I was at the game, I didn’t get to see the video footage of Garland being told he was traded. To the other dug out. At least he’ll have a shorter travel time than Thome. However, I did wonder if he was staying at the team hotel. And if he rode on the team bus to get to the stadium. Someone said he lived local, so he probably drove himself to the stadium. Can you imagine though if he did ride on the team bus to get to the stadium? I joked about Jon needing to find a different ride to get back to the team hotel. me, so they knew about it too. Speaking of trades. 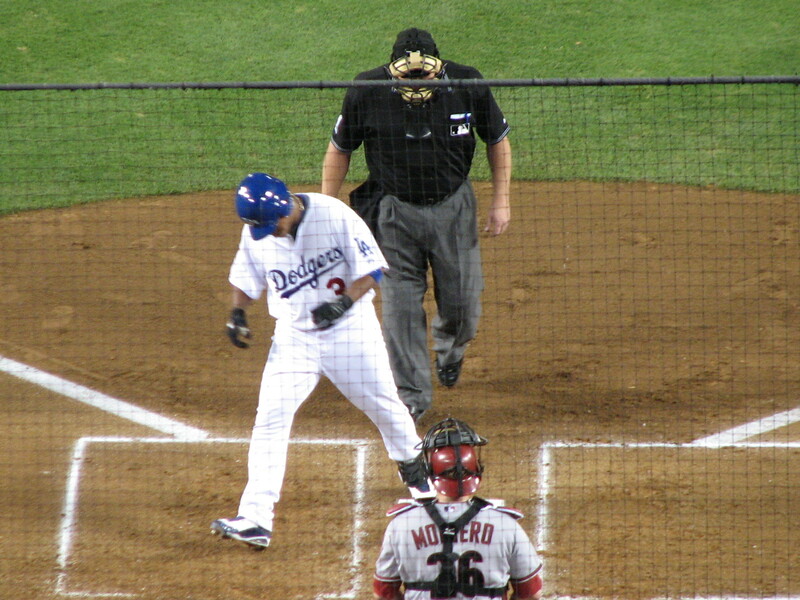 Today was the Dodger debut of newly acquired Ronnie Belliard. What did he do in his first at-bat as a Dodger? He hit a home run! And no, he didn’t finish the game with a cycle. That would’ve been nice. Someone noticed this guy down by the McCourt’s box. At first, they thought it was Tommy Lasorda. But I saw Tommy leave already. Then we figured it was probably Bill Plaschke. Someone commented about how stupid it was for Plaschke to be sitting that close to the field with his back to the action. I joked that if he got hit because he wasn’t paying attention to the action, there wouldn’t be that many people in L.A. who would feel bad for him.